These capabilities are automatically discovered when registering the agent. The agent’s capabilities are cataloged so that only the builds and releases it can handle are assigned to it. For example, if your build includes a MSBuild 15.0 task, then the build won’t run unless there’s a build agent in the pool that has MSBuild 15.0 installed. Note: You’ll need to restart (possibly even re-configure) your agent to update capabilities that are added/removed. The requirements for capabilities are controlled in the build definition’s Demands section (under Options). 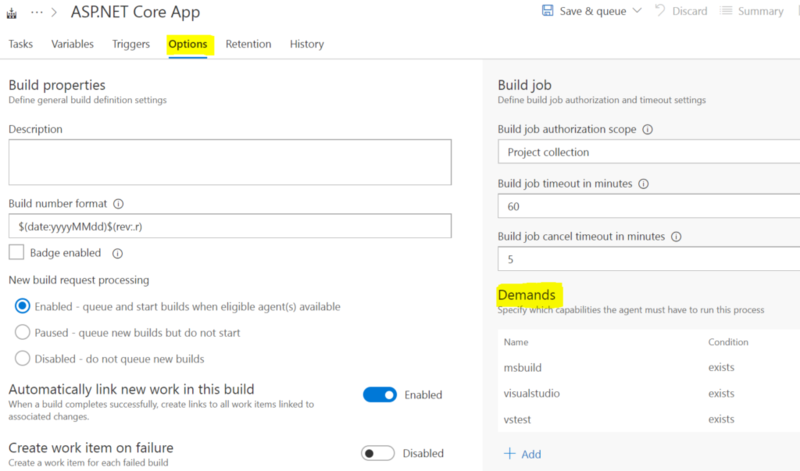 Demands are automatically added if required by the build steps in the definition. The demands can have conditions that check if the capabilities exist, or equal a value. I then added the variable AgentComputerName to the definition and set it to “Settable at queue time”. This way I could queue a build, enter the machine name I wanted it to run on, and the demand would ensure the assigned agent ran on the chosen machine. The new capabilities and demands system in Build vNext gives us the same features as the old tagging system but makes a lot more sense in context. Additionally with the new web interface and the auto detection on the agent of many of the needed values the whole process gets a lot simpler. Azure Release Pipelines: What releases haven’t been deployed to Production yet?